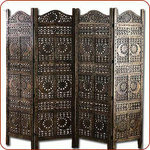 Browse our selection of beautifully handcrafted decorative screens and room dividers. 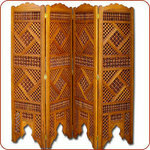 These folding room divider screens are handcrafted and imported from North Africa and Asia. The craftsmanship on these pieces of art is simply breathtaking. 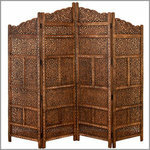 Needless to say, the decorative screens and dividers in our selection will make fantastic conversational pieces while adding an air of exoticness to any room. 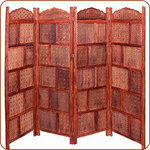 The wood usually used to create these folding screens room dividers are cedar and rosewood. 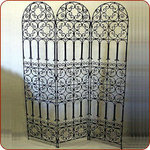 We also have a couple of wrought iron room dividers to choose from. Which ever type is chosen, you can be assured they are both beautiful as well as functional. 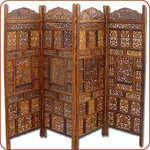 The sizes of these decorative screens and room dividers vary. However, they stand around 6 feet or 72 inches in height and 50 inches to 80 inches wide when flattened. Some units come with 3 panels and some with 4.